Modeled after the very binoculars Steiner provides for the military, Steiner’s 8×30 Military-Marine set is designed to provide high-quality optics in rugged conditions. Steiner brings the best of its near 70 years of experience to this set, with convincing results. They’re touted as fit for any environment and purpose, a claim backed by the set’s firm construction and finely tuned features. The 8×30 Military-Marine set breaks out of its combat roots to provide quality visuals to environmentalists, hunters, and sports enthusiasts. Steiner’s Military-Marine binoculars provide an impressive field of view and excel at long range observation. Their main draw is Steiner’s patented Auto-Focus system. After adjusting each eyepiece to each of the viewer’s eyes, Auto-Focus keeps images sharp, allowing for seamless tracking of moving objects. The multi-coated lenses provide impressive and consistent levels of brightness and clarity, actively prevent ruinous glares, and resist fogging up on account of environmental conditions. Overall, the set operates finest at mid to long ranges. The Auto-Focus system becomes effective as close as 20 yards, but does its best work at greater distances. At 100 to 1000 yards, the precision of the set’s Auto-Focus is in a class above many other models. Every corner of the wide image stays in peak focus, even at great distances. Steiner’s 8×30 Military-Marine binoculars match the implications of their name. The set is built like a tank and takes any abuse in stride. The rubber-armored housing is extremely rugged and feels right at home in rocky outdoor environments. The 8×30 Military-Marine binoculars are sturdy without taking on weight, and are comfortable to hold and carry. The mechanisms are stiff and hold their position, which is most beneficial to the focus. The military influences are most prevalent in the set’s construction. They are built to last without need for repair or even caution. The 20mm long eye relief is great for glasses wearers, and is another small nuance feature that increases the value of the set. Steiner’s long experience pays off in fashion, durability, and comfortability when it comes to the construction of the product. 8×30 Military-Marine set’s weather resistant features function well, providing the necessary security from rain and fog. At 18 ounces, the 8×30 Military-Marine set is hardly a burden and is shaped compactly enough that it never feels awkward keeping them at ready. The binoculars are highly portable, and fit any ensemble for any environment as advertised. Feature-laden as the set is, holding, transporting, and using it is quite simple. The rubber-armored housing lacks the weight other models have without sacrificing protection, combining convenience with some needed assurance. The 8×30 Military-Marine binoculars prove every claim Steiner makes for them. Sleek, sturdy, military design influences make the set one of the better mid to long range binoculars on the market. They are very versatile without becoming under-specialized, general purpose items. Instead, the set is master of all its trades, particularly suited for exploration and observance but equally capable in more leisurely settings. The binoculars come with every feature they need, from magnification to value and practicality. Steiner’s Sports Auto-Focus stands out in the optics department while the sturdy but streamlined physical design provides excellent longevity and portability. 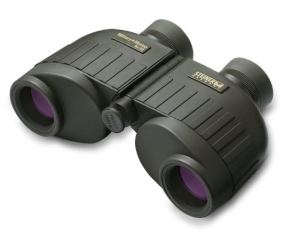 Steiner’s 8×30 Military-Marine binoculars are simply put, some of the best that most people will ever own.